Alternative given names for him are given as Jan-Baptiste van Helmont, Johannes Baptista van Helmont, Johann Baptista von Helmont, and Joan Baptista van Helmont, also with minor variants alternatively switching 'von' for 'van'. Jan Baptist van Helmont (/ˈhɛlmɒnt/; Dutch: [ˈɦɛlmɔnt]; 12 January 1580 – 30 December 1644) was a Flemish chemist, physiologist, and physician. He worked during the years just after Paracelsus and the rise of iatrochemistry, and is sometimes considered to be "the founder of pneumatic chemistry". Van Helmont is remembered today largely for his ideas on spontaneous generation, his 5-year tree experiment, and his introduction of the word "gas" (from the Greek word chaos) into the vocabulary of science. Van Helmont was the youngest of five children of Maria (van) Stassaert and Christiaen van Helmont, a public prosecutor and Brussels council member, who had married in the Sint-Goedele church in 1567. He was educated at Leuven, and after ranging restlessly from one science to another and finding satisfaction in none, turned to medicine. He interrupted his studies, and for a few years he traveled through Switzerland, Italy, France, Germany, and England. Returning to his own country, van Helmont obtained a medical degree in 1599. He practiced at Antwerp at the time of the great plague in 1605. In 1609 he finally obtained his doctoral degree in medicine. The same year he married Margaret van Ranst, who was of a wealthy noble family. Van Helmont and Margaret lived in Vilvoorde, near Brussels, and had six or seven children. The inheritance of his wife enabled him to retire early from his medical practice and occupy himself with chemical experiments until his death on 30 December 1644. The Roman tower of the old church in Neder-Over-Heembeek and house where van Helmont performed an alchemical transmutation. Drawing by Leon Van Dievoet, 1963. Van Helmont is regarded as the founder of pneumatic chemistry, as he was the first to understand that there are gases distinct in kind from atmospheric air and furthermore invented the word "gas". He perceived that his "gas sylvestre" (carbon dioxide) given off by burning charcoal, was the same as that produced by fermenting must, a gas which sometimes renders the air of caves unbreathable. For Van Helmont, air and water were the two primitive elements. Fire he explicitly denied to be an element, and earth is not one because it can be reduced to water. 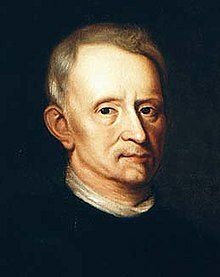 On the one hand, Van Helmont was a disciple of Paracelsus (though he scornfully repudiated his errors as well as those of most other contemporary authorities), a mystic and alchemist. On the other hand, he engaged in the new learning based on experimentation that was producing men like William Harvey, Galileo Galilei and Francis Bacon. Van Helmont was a careful observer of nature; his analysis of data gathered in his experiments suggests that he had a concept of the conservation of mass. He performed an experiment to determine where plants get their mass. He grew a willow tree and measured the amount of soil, the weight of the tree and the water he added. After five years the plant had gained about 164 lbs (74 kg). Since the amount of soil was basically the same as it had been when he started his experiment (it lost only 57 grams), he deduced that the tree's weight gain had come from water. Since it had received nothing but water and the soil weighed practically the same as at the beginning, he argued that the increased weight of wood, bark and roots had been formed from water. Although a faithful Catholic, he incurred the suspicion of the Church by his tract De magnetica vulnerum curatione (1621), against Jean Roberti, which was thought to derogate from some of the miracles. His works were collected and edited by his son Franciscus Mercurius van Helmont and published by Lodewijk Elzevir in Amsterdam as Ortus medicinae, vel opera et opuscula omnia ("The Origin of Medicine, or Complete Works") in 1648. Ortus medicinae was based on, but not restricted to, the material of Dageraad ofte Nieuwe Opkomst der Geneeskunst ("Daybreak, or the New Rise of Medicine"), which was published in 1644 in Van Helmont's native Dutch. His son Frans's writings, Cabbalah Denudata (1677) and Opuscula philosophica (1690) are a mixture of theosophy, mysticism and alchemy. Over and above the archeus, he believed that there is the sensitive soul which is the husk or shell of the immortal mind. Before the Fall the archeus obeyed the immortal mind and was directly controlled by it, but at the Fall men also received the sensitive soul and with it lost immortality, for when it perishes the immortal mind can no longer remain in the body. Van Helmont described the archeus as "aura vitalis seminum, vitae directrix" ("The chief Workman [Archeus] consists of the conjoyning of the vitall air, as of the matter, with the seminal likeness, which is the more inward spiritual kernel, containing the fruitfulness of the Seed; but the visible Seed is onely the husk of this."). In addition to the archeus, van Helmont believed in other governing agencies resembling the archeus which were not always clearly distinguished from it. From these he invented the term blas (motion), defined as the "vis motus tam alterivi quam localis" ("twofold motion, to wit, locall, and alterative"), that is, natural motion and motion that can be altered or voluntary. Of blas there were several kinds, e.g. blas humanum (blas of humans), blas of stars and blas meteoron (blas of meteors); of meteors he said "constare gas materiâ et blas efficiente" ("Meteors do consist of their matter Gas, and their efficient cause Blas, as well the Motive, as the altering"). Van Helmont "had frequent visions throughout his life and laid great stress upon them". His choice of a medical profession has been attributed to a conversation with the angel Raphael., and some of his writings described imagination as a celestial, and possibly magical, force. Though Van Helmont was skeptical of specific mystical theories and practices, he refused to discount magical forces as explanations for certain natural phenomena. This stance, reflected in a 1621 paper on sympathetic principles, may have contributed to his prosecution and subsequent house arrest. Van Helmont wrote extensively on the subject of digestion. In Oriatrike or Physick Refined (1662, an English translation of Ortus medicinae), van Helmont considered earlier ideas on the subject, such as food being digested through the body's internal heat. But if that were so, he asked, how could cold-blooded animals live? His own opinion was that digestion was aided by a chemical reagent, or "ferment", within the body, such as inside the stomach. Harré suggests that van Helmont's theory was "very near to our modern concept of an enzyme". Van Helmont proposed and described six different stages of digestion. In 2003, the historian Lisa Jardine proposed that a portrait held in the collections of the Natural History Museum, London, traditionally identified as John Ray, might represent Robert Hooke. Jardine's hypothesis was subsequently disproved by William Jensen of the University of Cincinnati and by the German researcher Andreas Pechtl of Johannes Gutenberg University of Mainz, who showed that the portrait in fact depicts van Helmont. ^ Van Helmont's date of birth has been a source of some confusion. According to his own statement (published in his posthumous Ortus medicinae) he was born in 1577. However, the birth register of St Gudula, Brussels, shows him to have been born on 12 January 1579 Old Style, i.e. 12 January 1580 by modern dating. See Partington, J.R. (1936). "Joan Baptista Van Helmont". Annals of Science. 1 (4): 359–84 (359). doi:10.1080/00033793600200291. ^ Digitaal Wetenschapshistorisch Centrum (DWC) – KNAW: "Franciscus dele Boë"
^ "Helmont". Random House Webster's Unabridged Dictionary. ^ a b Holmyard, Eric John (1931). Makers of Chemistry. Oxford: Oxford University Press. p. 121. ^ a b Van den Bulck, E. (1999) Johannes Baptist Van Helmont Archived 26 May 2008 at the Wayback Machine. Katholieke Universiteit Leuven. ^ Partington, J. R. (1951). A Short History of Chemistry. London: Macmillan. pp. 44–54. ^ a b John Baptista Van Helmont; John Chandler (translator) (1662). Oriatrike, or Physick Refined (English translation of Ortus medicinae). ^ Moon, R. O. (1931). "President's Address: Van Helmont, Chemist, Physician, Philosopher and Mystic". Proceedings of the Royal Society of Medicine. 25 (1): 23–28. ^ Jensen, Derek (2006). The Science of the Stars in Danzig from Rheticus to Hevelius. ProQuest. p. 131. Retrieved 25 February 2015. ^ Clericuzio, Antonio (1993). "British Journal for the History of Science". Proceedings of the Royal Society of Medicine. 26 (3): 23–28. ^ Redgrove, H. Stanley (1922). Joannes Baptista van Helmont; alchemist, physician and philosopher. London: William Rider & Son. p. 46. ^ Harré, Rom (1983). Great Scientific Experiments. Oxford: Oxford University Press. pp. 33–35. ISBN 978-0-19-286036-1. ^ Foster, Michael (1970) . Lectures on the History of Physiology. New York: Dover Publications. pp. 136–144. ISBN 978-0-486-62380-1. ^ Jardine, Lisa (19 June 2010). "Mistaken identities". The Guardian. Retrieved 13 January 2015. ^ Jensen, William B. (2004). "A previously unrecognized portrait of Joan Baptist van Helmont (1579–1644)" (PDF). Ambix. 51 (3): 263–268. doi:10.1179/amb.2004.51.3.263. Ducheyne, Steffen (1 April 2006). "Joan Baptista Van Helmont and the Question of Experimental Modernism". ResearchGate. pp. 305–332. Retrieved 13 December 2018. Young, J.; Ferguson, J. (1906). Bibliotheca Chemica: A Catalogue of the Alchemical, Chemical and Pharmaceutical Books in the Collection of the Late James Young of Kelly and Durris ... Bibliotheca Chemica. J. Maclehose and sons. p. 381. Retrieved 13 December 2018. Eugene M. Klaaren, Religious Origins of Modern Science, Eerdmans, 1977, ISBN 0-8028-1683-5. Moore, F. J. (1918). A History of Chemistry, New York: McGraw-Hill. Pagel, Walter (2002). Joan Baptista van Helmont: Reformer of Science and Medicine, Cambridge University Press. Isely, Duane (2002). One Hundred and One Botanists. West Lafayette, Indiana: Purdue University Press. pp. 53–55. ISBN 978-1-55753-283-1. OCLC 947193619. Retrieved 13 December 2018. Redgrove, I. M. L. and Redgrove, H. Stanley (2003). Joannes Baptista van Helmont: Alchemist, Physician and Philosopher, Kessinger Publishing. The Moldavian prince and scholar, Dimitrie Cantemir, wrote a biography of Helmont, which is now difficult to locate. It is cited in Debus, Allen G. (2002) The Chemical Philosophy: Paracelsian science and medicine in the sixteenth and seventeenth centuries. Courier Dover Publications, ISBN 0486421759 on pages 311 and 312, as Catemir, Dimitri (Demetrius) (1709); Ioannis Baptistae Van Helmont physices universalis doctrine et christianae fidei congrua et necessaria philosophia. Wallachia. Debus refers to a suggestion of his colleague William H. McNeill for this information and cites Badaru, Dan (1964); Filozofia lui Dilmitrie Cantemir. Editura Academici Republicii Popular Romine, Bucharest pages 394–410 for further information. Debus further remarks that the work of Cantemir contains merely a paraphrase and selection of "Ortus Medicinae", but it made the views of van Helmont available to Eastern Europe. Nature 433, 197 (20 January 2005) doi:10.1038/433197a. Claus Bernet (2005). "Jan Baptist van Helmont". In Bautz, Traugott (ed.). Biographisch-Bibliographisches Kirchenlexikon (BBKL) (in German). 25. Nordhausen: Bautz. cols. 597–621. ISBN 3-88309-332-7. Thomson, Thomas  (1830). The History of Chemistry, London: Henry Colburn and Richard Bentley.